This is a demo version of project what is under development now. Therefore some features may not work for now. The demo is developed using C# under Microsoft Visual Studio .NET environment. It includes Microsoft Access database where the data is retrieved from, and couple of data entry dialogs. You can download source code of this project from here (warehousedemosource.zip ~70kB). In this example is shown dialog with the navigation toolbar. This example browse data from two databases with the relation between them and has data entry possibility. User can navigate backward, forward, to the first and to the last record in the database. 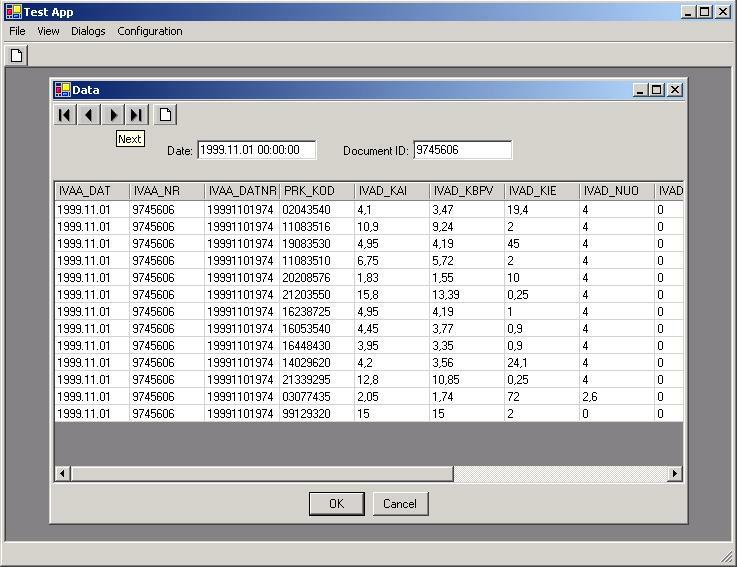 In the header of the dialog the data from parent records is shown. And in the grid control child records relative to the parent record is displayed. Grid control is refreshed every time the parent record is changed.